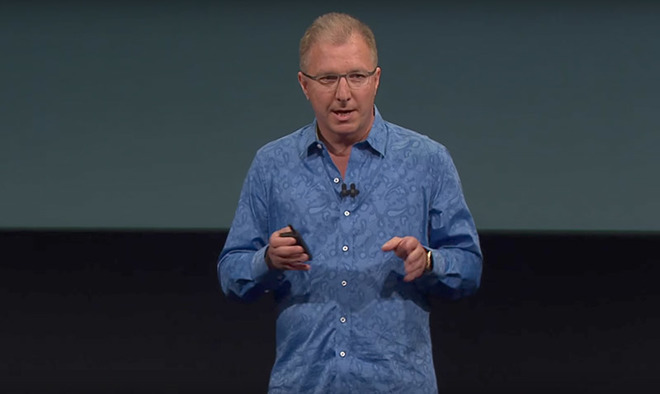 Apple marketing lead Greg Joswiak presents iPhone SE at a special event in 2016. Joswiak touched on ARKit, the upcoming HomePod speaker and machine learning in an interview with The Australian on Thursday. In particular, developers are showing healthy interest in coding AR apps for iOS, the platform that will serve as Apple's launching pad into the cutting edge technology. "They've built everything from virtual tape measures (to) ballerinas made out of wood dancing on floors," Joswiak said. "It's absolutely incredible what people are doing in so little time." The executive was likely referring to an ARKit demo app called AR Measure that went viral earlier this week thanks to Twitter and other social media sites. A simple idea that is incredibly difficult to accomplish using standard 2D cameras, AR Measure lays down a virtual tape measure in real space. ARKit simplifies the coding process by tapping into iPhone's sensor suite and handling complex real-time spacial awareness algorithms. Joswiak also name checked Ikea, which is building a shopping app that uses ARKit tools to superimpose furniture in a customer's room. In the commercial sector, Joswiak sees AR apps evolving for shopping, furniture placement, education, training and services. "I think there is a gigantic runway that we have here with the iPhone and the iPad. The fact we have a billion of these devices out there is quite an opportunity for developers," he said. "Who knows the kind of things coming down the road, but whatever those things are, we're going to start at zero." As for HomePod, Joswiak said he expects third-party smart home device manufacturers to launch "plenty" of HomeKit compatible products in the Australian market before the speaker ships in December. Currently, the selection is a bit sparse compared to Apple's domestic market. HomeKit control is a tentpole feature for HomePod, which will launch as Apple's first in-home Siri product. Finally, Joswiak touched on machine learning, saying Apple was using the technology to better customer experiences long before it became a Silicon Valley buzzword. "We've been implementing machine learning in our products long before it was fashionable to call it machine learning," he said. For example, the soft keyboard on the original iPhone would automatically modify button touch zones depending on how a user typed. More recently, the company has applied similar machine learning assets to power autocorrect and word recommendation features. Apple is taking the tech a step further with iOS 11 by powering features like handwriting recognition for iPads, he said.